This is my fifteenth Purana review. It is also my last tamasik Purana review. The Agni Purana is an interesting Purana. It is eighth in the list of Mahapuranas. It is not too long, it has fifteen and a half thousand shlokas. These shlokas are further divided into three hundred and eighty-three chapters. The Agni Purana is named thus as it was narrated by the fire – god Agni. Vashishta narrated this Purana to Vedavyasa. Vedavyasa narrated it to Suta who narrated it to some sages in the Namisharanya forest. This Purana has lots of information on rituals, omens, social norms, duties of a king, etc. There are very few stories and even those are in a summarized form. Apart from this, it also narrates the ten avatars of Vishnu along with a short version of the Mahabharata. The duties of a king are described as well. Now let me narrate my favourite story. As you know from before, this Purana has few stories as it concentrates more on other things. Out of those few stories, I came across one which was short and simple but interesting. This is the story which I will narrate. Do you ever wonder why the demons are called asuras? The answer is in the story below. Most of you know that during the churning of the ocean or the Amrita manthan many things came out. Things such as the parijata tree, the horse Ucchaishrava and the elephant Airavata. Among these amazing things also came out the goddess Varuni. She was the goddess of wine or sura. The gods liked the wine and accepted her, so they were known as suras. The demons did not accept her, so they were known as asuras. Some of you might have heard about this story before. I chose this story because it was the only one I hadn’t heard about. There are a few other things I want to include in this review. Most of you may have visited a temple sometime or the other. But, have you ever thought of building one? If you have then you are blessed and have been forgiven for all the sins in your past hundred lives. If you build one temple you go to heaven. The more temples you build, the different heavens you go to. Building sixteen temples frees you from being born again on Earth. You get more punya or merit if you build idols instead of temples. But to build idols you have to take care of lots of things. It is easier to build temples than idols. I like temples and enjoy visiting them too. This is a very holy mantra. It is composed after the goddess Gayatri who is so holy that even Vishnu and Shiva worship her. She is in everybody’s heart in the form of a swan. If you recite this mantra 7 times all your sins are forgiven. If you chant it 10 times you attain heaven. Chanting it 20 times ensures you go to lokas better than heaven. If you chant it 108 times you are not born again and if you want to be forgiven from the most terrible sins you have to chant it 1000 times. The Gayatri mantra is like building a temple because you are forgiven for your sins. This is an amazing and powerful mantra which everyone should recite, starting with the word Om. The Purana also talks about omens and dreams. Most of the dreams make sense. However, the strange thing is that if you dream of your head being cut off, or that you are dead or that your house has burnt down it is good. You are blessed, and your relatives increase in number. I found this very strange and weird as death is related to evil and bad stuff, so it was a shock to me when I read this. I also found many useful things. One thing that I found was that it was a good omen if you saw clarified butter or curds before leaving for a journey. There are many others, but this is the one I wanted to share as it was most useful. At least now you know what to see before leaving right? The last few chapters talk about the brahman and brahma – Jnana which is the true knowledge of the brahman and the union of the soul or atman with the brahman. 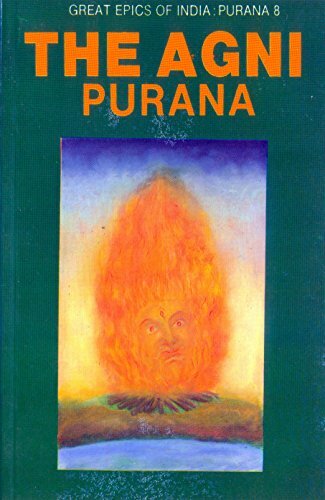 The end of the Purana describes the virtues of the Agni Purana. The Agni Purana is so virtous that if it is kept in the house all the ill omens vanish and ghosts and thieves stay away from that house. If you wish to hear it all the sins in a day are forgiven. There are many more virtues so why don’t you find out yourself.